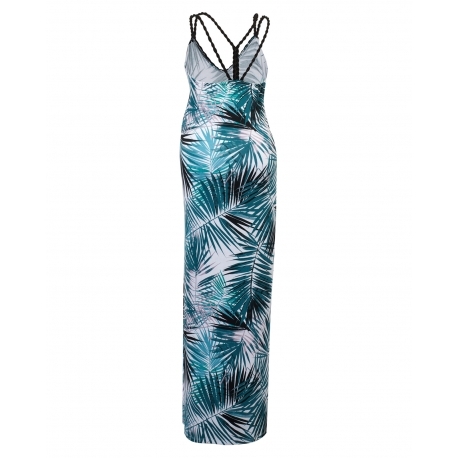 Maxi dress for pregnant women and for feeding in a fashionable floral pattern. It's the perfect outfit for hot summer in the city and on vacation. Delicate braided straps add lightness to the dress. Its simple cut will visually lengthen and slim the silhouette. Black hand braided strap emphasizes the pregnancy tummy. Deep neckline in a maternity dress, perfect for feeding. Our Nona dress is also perfect for pregnancy, as a classic maxi dress for hot summer days. Choose classic white or black sneakers, comfortable sandals and a bag in the form of a bag, your styling will be ready in less than a minute. Washing instructions - machine wash at 30 degrees (gentle program), dry in a horizontal position, without centrifuging. You can not dry clean, do not use bleach. Iron in 110 degrees.